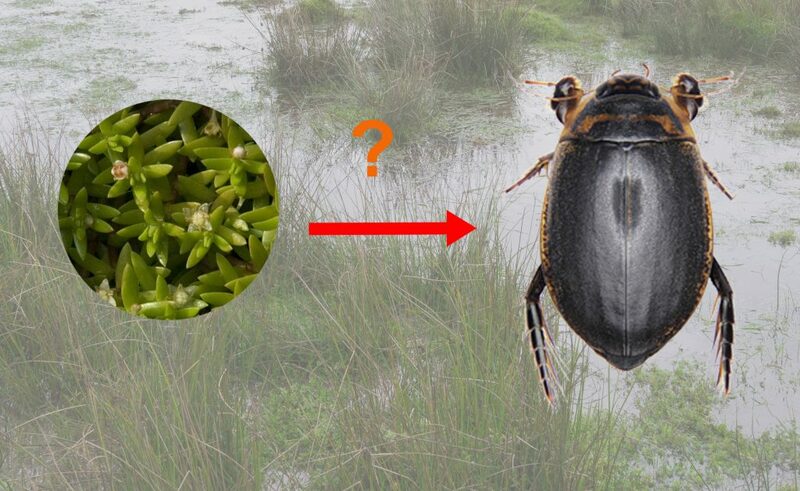 The ecological impacts of an aggressive aquatic invader: is Crassula helmsii the biggest threat to European freshwater biodiversity? Biological invasions represent one of the most significant threats to biodiversity on the planet. Freshwaters are both disproportionately affected by such invasions, and home to a disproportionately large proportion of biodiversity, especially invertebrates. They also provide crucial ecosystem services. Crassula helmsii, a native Australasian aquatic plant, has been aggressively invading European freshwaters for over 30 years, with drastic consequences for their biodiversity although, to date, detailed studies have been restricted to impacts on aquatic flora. Preliminary data suggest that Crassula stands are relatively devoid of invertebrate life and that, with its CAM metabolism, Crassula may be exerting a toxic influence upon invertebrates in the freshwaters it invades. Given Crassula’s rapid ongoing spread, there is an urgent need to better understand the species impacts on aquatic invertebrates, particularly from the perspective of informing the management and maintenance of freshwater biodiversity in the landscape. This project will examine the effects of Crassula upon freshwater invertebrates via three approaches: field survey, laboratory mesocosm trials, and biochemical assays. The student will receive training in the conduct and analysis of all three; from freshwater invertebrate taxonomy through experimental design for toxicity trials, to advanced univariate and multivariate analyses of ecological and spectrometric data. They will gain experience of fieldwork alongside experienced scientists and government officers, develop knowledge of cutting-edge approaches in biostatistics using R, break new ground in the application of rapid analytical techniques such as FTIR spectrometry to secondary chemistry in plants, and test fundamental ecological hypotheses about the mechanistic bases for the spread and control of invasive species. They will have the opportunity to develop skills and gain qualifications as a university demonstrator, disseminate their work and its results via both written and oral outputs, and will build a library of skills and competences that will elevate their employability to a level commensurate with doctoral status, applicable across a wide range of employment opportunities. We are seeking a candidate prepared for fieldwork and work in the laboratory; you must be numerate and literate; some demonstrable experience in invertebrate taxonomy and identification is desirable. Euwald, N. 2014. Crassula helmsii in the New Forest – a report on the status, spread and impact of this non-native invasive plant, and the efficacy of control techniques following a 2 year trial. Freshwater habitats Trust. Bilton, D.T., McAbendroth, L.C., Nicolet, P., Bedford, A., Rundle, S.D., Foggo, A. & Ramsay, P.M. 2009. Ecology and conservation status of temporary and fluctuating ponds in two areas of southern England. Aquatic Conservation Marine and Freshwater Ecosystems 19: 134-146. Bilton, D.T., McAbendroth, L., Bedford, A. & Ramsay, P.M. 2006. How wide to cast the net? Cross-taxon congruence of species richness, community similarity and indicator taxa in ponds. Freshwater Biology 51: 578-590. Borell E.M., Foggo A., Coleman R.A. 2004. Induced resistance in intertidal macroalgae modifies feeding behaviour of herbivorous snails. Oecologia 140: 328–334.